Every parameter in Soniformer is defined by means of a graphic envelope which is freely-modifiable and which may contain unlimited number of control points. 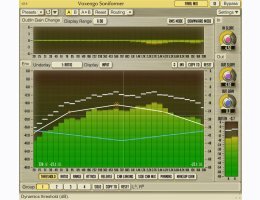 Beside usual threshold, attack, release and compression/expander ratio parameters Soniformer offers you control over stereo width and panning parameters making Soniformer an effective tool for stereo field adjustments. Not only Soniformer offers you an easy-to-use parameter envelope editing interface, it also features a comprehensive set of spectral metering tools: you can switch between input, output, stereo correlation and stereo balance spectrums. The spectral gain change meter that is always present on the user interface gives you an outline of the overall signal power change applied by the plug-ins processing chain. (2 GHz dual-core or faster processor with at least 1 GB of system RAM required).